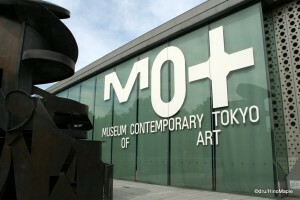 The Museum of Contemporary Art Tokyo is located in the busy suburbs of Tokyo. Located inside Kiba Park, just a few minutes away from central Tokyo, the Contemporary Art Museum is not well known, even by locals. Most tourists will not think to visit this museum but recently there was a very interesting exhibit that I just had to visit. I went to see the Tokusatsu Exhibit which was an exhibit showcasing how they created monster movies in the past. The typical Japanese monster movies were about Godzilla and Ultraman, but today they have expanded into other series such as Kamen Rider. In North America, we were graced with this style of film with the Power Rangers, a group of 5 teenage heroes that fought evil monsters that would grow to the size of Godzilla. The exhibit was held from July 10 till October 8 and it was a very interesting look into how these types of films were made and the level of detail that went into each one. When I first saw the information on the exhibit, I thought it would be a simple exhibit that would be easy to visit within an hour. I was completely wrong as it took nearly 2 hours. I could easily have used more time to see the entire exhibit. The exhibit started with various models showcasing props used in what I have to guess was the Ultraman series. I have never actually watched Ultraman and my knowledge of Ultraman is limited to the action figures as well as the short clips I see on Japanese TV shows. There were various space ships and other futuristic vehicles on display. They also had various Ultraman masks as well as masks of other monsters in the series. It was really cool to see these masks in full size. Most of the original production masks were available to see but unfortunately photos were not allowed in the museum except for a small section. The detail of each mask was not very precise but the look and craftsmanship that went into each mask was. Looking at the masks and costumes for the characters, especially Godzilla was a lot of fun. To see a full sized Godzilla, not a true size but the same size used for filming, was something that I will remember for a long time to come. The best part of the exhibit was seeing all of the different models of various buildings and locations. Each model was done at various scales but the level of detail for each model was astonishing. There were models of old buildings and new ones too. 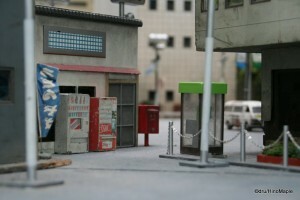 They had famous street corners as well as Japan’s National Diet Building, which was in a post-apocalyptic state in the model. It is impossible to really tell you how detailed it was but to give you an idea, they had everything you could think of in each model. You could see various coat hangers and laundry being dried outside of the homes. Each tile was moulded and even the signs were created with extreme detail. While most of the models had a lot of detail, some of them didn’t have a lot of detail. The models themselves had to look as real as possible and they did a great job with it. 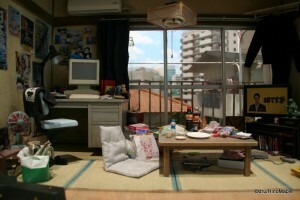 There was one model where they had a built a typical apartment room. There was laundry lying around the room, the light was created with individual light bulbs, and even the TV had an image on it. Sometimes they had real company names within the models and sometimes they used their own names. The detail even recreated the bad English you see in various signs in Japan. I’m not too sure if that is a good or bad thing but it is very interesting to see that. The next time you watch a Japanese monster movie, be sure to pause the movie a bit and check the detail in the city and realize that a lot of work went into it and if it is a real monster movie, it would be destroyed in the movie very soon. The best part of the exhibit was the ability to play around on a nearly full sized set. The only area to allow photos was the set used to create a movie for the exhibit. 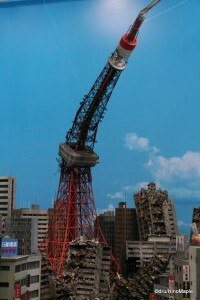 The set they created had a mangled Tokyo Tower as well as other buildings that were in various states of conditions from pristine buildings spared by the monsters to buildings completely destroyed in the battle. There were small tanks and debris littering the roads and they even included the TV monitors on the side of the set for the director to watch while filming. These monitors were fully functioning so you could imagine you were actually the director. 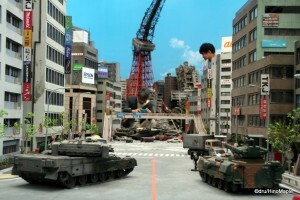 There was a space for people to walk through within the set to imagine that they were a Godzilla themselves. It was a wonderful set and I could have played there all day if I had the time. I can’t even fathom how much time was spent creating the city. Of course we weren’t allowed to walk through the city itself, aside from the designated path in the middle, but we were allowed to get very close. I never imagined that I could ever be in part of a Godzilla movie, or something similar, but one of the dreams I never thought about had come true. The exhibit was equal parts education and entertainment. The exhibit was great and very historical showcasing how movies were made in the past. It was also educational in the respect that they showed how the various parts such as the light on Ultraman’s chest or how the actual Godzilla suit was made. To see an old man using a single rock to put texture into a clay mould that would be used to create Godzilla looked mind numbing. The patience required for that was astonishing. To also see a modern Tokusatsu short film being created and how they made it was also very fun. The movie created for the exhibit was only 10 minutes long but it was very much along the lines of the director from the Neon Genesis series. It was very dystopian without the dose of, “we can overcome anything if we put our minds to it”. It was completely, “wipe the earth clean and start from nothing”. Thankfully these are just creative works of art and the skill required to make such movies is unfortunately dying. They are still being made but the use of CG is growing and the skills required to create these small models is becoming more and more elusive. It probably won’t die as there are lots of people who love to create miniature models, but the ability to create and film one, as well as getting the budget to do so is dwindling as the market is shrinking for such movies. Next time you watch one of these films, be sure to take the time to appreciate the craftsmanship that went into make it. This entry was posted in Culture, Tokyo and tagged art, CG, Contemporary Art, dystopian, Evangelion, future, futuristic, Godzilla, japan, Japanese TV, Kamen Rider, Kiba, Kiba Park, museum, Museum of Contemporary Art, Museum of Contemporary Art Tokyo, Neon Genesis, Neon Genesis Evangelion, Power Rangers, set, Tokusatsu, tokyo, Tokyo Tower, Ultraman by Dru. Bookmark the permalink. OMO! I so want to see this exhibit. PS: Is this Kiba Park in Koto-ku? I doubt people would complain. I haven’t seen it yet. Too bad much of this exhibition doesn’t allow photographs to be taken. I’m glad the above part did allow photos though! I would have cried if we couldn’t. Thankfully we could.